lthough my trip to New York DID involve carbs and fillings (read on), I’m calling it a sandwich trip because the L part (leisure) was sandwiched between the B part (business). I realized during my time away that sometimes one leaks into the other (like tomato on bread). I spent two days in “the city” (as we native New Yorkers call it — as if there can be only one). In-between I went out to East Hampton to visit family. It’s way less crazy on weekdays, so it was a wonderful summer treat. The beach is practically empty on Tuesdays and Wednesdays! Then I returned to the city before ending my week away. Travel Tip: Even on your “business days,” be sure to add a little something in for fun if time permits. And on your “leisure days,” allow time in the early morning or evening to catch up on time-critical work. Where I rest my head: I’m something of a creature of habit (and a Hilton points hoarder) so I usually stay at the Renwick Hotel. It’s centrally located, not too far from the airport or Hamptons bus, you can sometimes get good deals there and the rooms are a bit bigger than the usual closet-sized NYC rooms. My other Manhattan fave these days in the INNSIDE New York Melia. They offer free beverages and a Nespresso machine in every room. Classy touch. 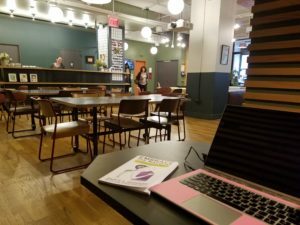 Where I get things done: WeWork is my home base and has been for years. As a bleisure traveler,you can find one in almost every major city. Plus, the different locations have distinctly different personalities and occupants, so you can vary your location based on your mood. 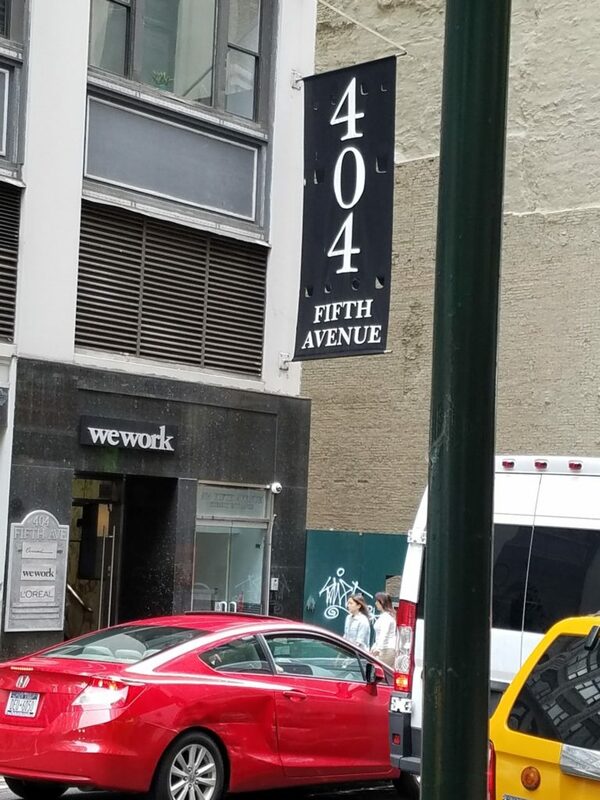 Something interesting is always going on at WeWork too. A tabletop jewelry show was in the main lobby when I was there. Business Tip: Let your inner circle — and new prospects — know when you’re coming to town and hold “office hours” for a few hours each day. It’s a great way to meet live with people you may normally connect with via e-mail, LinkedIn, or Facebook groups. Named one of the best bagel places in NY. I will agree! 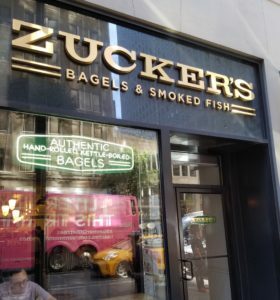 What I ate: I discovered a very convenient bagel store called Zucker’s right around the corner from the hotel. Because I live in Minneapolis and don’t generally eat carbs, a bagel and lox (flagel, actually) is a real treat. If you can, score a window seat and people-watch. My fave dinner places in New York are either steakhouses (although I don’t usually eat red meat). You can sit and the bar alone, get a great martini, and just blend in with the after-work crowd. (Ditto on the people-watching.) This time I went to Benjamin Prime. I’m also a huge fan of the bars at Hillstone restaurants. 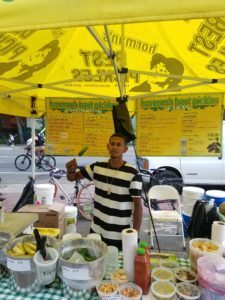 I had never been to my client’s New York pickle stand, so I Lyfted down to Carmine Street with Jamie Chew (creative director of this site), and we noshed on some Horman’s Best pickles. We’re redesigning his website, so we were seeking inspiration and brine. The beauty of being back in New York is that you can walk everywhere, and can easily burn off the calories. The sidewalks are your gym. How I got extra energy: On their website, Reviv claims to be “the leading global wellness provider of signature IV nutrient therapies and booster shots.” A friend turned me on to B12 about a year ago and I now swear by it. I try to get a shot whenever I’m in a city where they have a location. NOTE: I am not a medical professional, so if you decide to do it, proceed at your own risk. I’m just saying that they work for me. 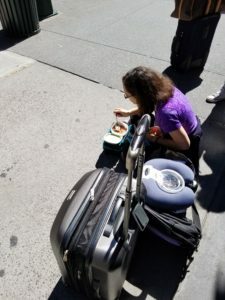 This woman was sitting on the sidewalk eating soup before boarding the bus. Benches were a few feet away. I guess she didn’t want to lose her place in line. A typical quirky NY sight. The Hampton Ambassador is a relatively easy way to get out east. If you go off-hours on a weekday (like a Wednesday) it’s very civilized. Free Wi-Fi, snacks, and a reserved seat make the time fly by, even in LIE (that’s Long Island Expressway) traffic. It attracts an eclectic crowd too, as the photo illustrates. Hillstone has a restaurant in East Hampton too (The East Hampton Grill), where you can sometimes spot a celebrity or a Real Housewife. The Palm is another great old standby. And Fresno’s outdoor patio is relaxing on a summer evening. But unless you’re into crowds and noise, weekdays are the best days to dine out during the summer — and you still usually need reservations. The weekends are at-home grilling time for me! The Montauk Farmers Market on Thursdays and the East Hampton Farmers Market on Fridays are both great. Because my pickle client is at both, I can actually be doing some work while I’m there. And lest you think I just eat all the time, I did go to the beach and hung out with family. Of course, I ran into someone I knew from work…blogger and curator Stacy Geisinger of Stacy Knows. No stranger to bleisure living, she was sunning and posting and chatting — staying connected while lounging in the sun. A woman after my own heart! Rather than heading straight to the airport, I spent one final day in New York, meeting with a client and speeding up my pulse for my return to civilization. Again, I camped out at WeWork, where I made a new “work friend” (who manufactures shoes — never a bad connection for a woman to have). Even if you’ve lived there most of your life (as I have), each trip there is a new adventure. And if you venture off the island of Manhattan and head up north, out east, or down south (to the Jersey Shore), you’ll discover a whole different pace and style. I highly recommend the New York “sandwich” approach — with or without the lox and pickles!